Now we can talk about square roots. In many contexts in math, we know the square of a number, and we have to solve for the original number that was squared. For example, if we have something like, x squared equals 5 and we need to find the x. If the square of the desired number happens to be a perfect square, then it's easy to solve. Getting x squared equal to a perfect square is a luxury that usually does not happen. Square roots and square root notation give us a way to talk about a situation in which the square of a variable does not equal a perfect square. Again, this is much more common than equalling a perfect square. For example, consider x squared equals 2, what number squared would equal 2? This would be a decimal between 1 and 2. We denote the positive number that, when squared, would equal 2 as, we use this notation. We read this either as the square root of 2, or radical 2. The square root and the act of squaring undo each other, precisely as addition and subtraction. Undo each other. This number, square root of 2 or radical 2, is a number on the number line, a decimal between 1 and 2. So it does, it has a home on the number line. It does live there. It's between 1 and 2. In this way, the the way that this number, radical 2 or the square root of 2, is connected to the rest of mathematics, is by virtue of the fact that we know if we were to square it, we would get 2 as a result. That is the definition of the number. By definition, it is the number which when squared gives two. We mentioned that the equation x squared equal 2, would actually have two solutions, 1 positive and 1 negative. When the radical sign is written, it means the positive root only. The other, the other negative square root of 2 we would have to write this way. We'd have to put a negative sign in front of a radical, negative radical 2 or negative square root of 2. That would be the second root. The second answer to the left of 0. Many students get confused about this issue of whether to include or not the negative square root, when do you include the negative square root? When do you not include the negative square root? It turns out there's a very easy rule for determining this. If the radical sign is written by the test-maker, written as part and parcel of the way the question is asked. If that sign is printed as part of the question. Then that means consider positive roots only. That is always what that sign means. But, if the problem contains a variable squared or your calculations lead to a variable squared and you yourself have to initiate the act of taking a square root yourself, so in other words, the square root sign is not printed as part of the problem. You're going to have to take a square root yourself in the act of solving the problem, then you always have to consider both the positive and negative roots. That's the difference right there. Whether the radical sign is printed on the test or not, that makes all the difference. So consider these two practice questions. These look similar, but they have different answers. Pause the video, work on both of these, and then we'll talk about these. Okay. Number one, is the square root of 2 greater than 1? By square root of 2 we, by printing that sign, printing the radical sign. We by definition mean, the positive root only. That positive root is a decimal between 1 and 2. So yes, it is definitely bigger than 1. That's perfectly clear. Now number 2 looks similar. K squared equals 2. Is k greater than 1? Well now, notice there's no radical sign printed. And so if I wanna get the value of k myself, I have to initiate the act of taking a square root myself. That means I have to consider both the positive and negative because I'm doing it myself. So, k would be either a positive square root of 2 or the negative square root of 2. And because it can be one or the other, we don't know whether it's larger than 1 or smaller than 1. So this answer cannot be determined. If q is positive, then square root of q is also positive. Can we take the square root of 0? Absolutely. We know that 0 squared is 0. So if we square it and get 0, we can certainly undo the squaring. That means that the square root of 0 equals 0. We can take the square root of 0, and it equals 0. So that's 100% legal right there. Can we take the square root of a negative? No. Positive, positives squared are positive. Negative squared are positive. 0 squared is 0. Nothing on the number line can be squared to yield a negative number. Now as it turns out there are higher forms of mathematics where they talk about square roots of a negative. That's called the imaginary numbers. You do not need to worry about this for the test. That is absolutely beyond anything that is on the test. So for our purposes, for the purposes of the test, for a is greater than or equal to 0, the square root of a is also greater than or equal to 0. If the test writes the equation, square root of a equals b. Radical a equals b. Then by virtue of writing that with, with an equals sign, the test is guaranteeing, that this is a sensible and completely valid mathematical equation. In other words, the test can never write an equation if the equation they're writing is not something that is mathematically legal. So this equation immediately tells us that a, must be either positive or equal to 0 and b, also must also be positive or equal to 0. So both of those things are guaranteed right away. Technically, the radical sign is called the principle square root sign. Which means that of the two possible square roots, this particular sign only returns the positive root. If the test says, solve the equation x squared equals 5, then of course there are two solutions. The positive solution is x equals positive square root of 5, or principle square root of 5. Radical 5. The negative solution is x equals negative radical 5. So, those are two numbers on the number line. 1 is to the left of 0. 1 is to the right of 0. And they both have the property that when we square them, we get 5. The test will expect you to recognize and simplify square roots of perfect squares. So of course, radical 36 has to equal 6. The test absolutely will not expect you to come up with the exact value of a square root that doesn't come out evenly. So the test will not say, calculate the exact value of the square root of 41. That's out of bounds. The test will not ask that. But, the test will expect you to know some basic approximations. First of all, for all positive numbers, the square root preserves the order of inequality. What bur, what do I mean by that? Well, if a is less than b is less than c. If they're in that particular order the inequalities then when we take the square root, they're still in exactly that same order. Square root of A is less than square root of B is less than square root of C. So that is true 100% of the time. If you have an inequality, you can take a square root of each term and it still preserves the order of the inequality. So we know, that 41 is greater than 36 and less than 49, it's between those two numbers. So we can just simply take a square root of all three of those. And of course, the square root of 36 and the square root of 49 we can simplify. So this tells us that the square root of 41, whatever it is, it has to be a decimal between 6 and 7. So, again, the test is not gonna expect you to know the exact value, it is gonna expect you to be able to figure out that the square root of 41 is a decimal between 6 and 7. Also, there are a few simple square roots for which you should know the rough approximations. Knowing these are very useful for approximations. If you just know these three to the nearest 10th, you can do a great deal of approximating, as we will see. The radical sign is an operator, just like addition, subtraction, multiplication and division signs. All those are operators and like those, it can operate on numbers or variables. We have to be mindful with this operator, it undoes squaring, but it is not an exact opposite. For example, suppose y is negative then y squared would be positive. Then the square root of y squared would also be positive, in other words we don't wind up with the original negative number, we don't wind up where we started. So, we have to be very careful, because it's always positive regardless of whether y is positive or negative. We have to say that the square root of y squared equals the absolute value of y. So, in other words, y is positive, then we get a positive output. If y is 0, we get 0. And, if y is negative, we get a positive outcome. If a variable appear, variable squared appears in a problem and we want to take the square root to, to undo the square, we always have to include the plus and minus sign. So again, the radical sign is not printed. We're the ones taking the square root. We always have to include that plus and minus sign. And, in many cases, we'd have to just put that plus or minus sign right in front of a radical. So here's a practice problem. Pause the video and see if you could solve this. Now of course one way to solve this, would be to foil that out. We have the square of a binomial, so figure out the square of that binomial, then subtract 16 from both sides, we get a quadratic, you'd factor that quadratic, that would be a long way to solve it. We have something squared. So notice all we have to do is take the square root of both sides. We're gonna take the square root of both sides, because we are initiating the act of taking the square root ourself. We're gonna have to include the plus or minus sign. So, taking the square root we get x minus 3 without the squared equals, plus or minus 4. Now we have two equations to solve. We, we have x equals 3 plus 4 and x equals 3 minus 4. And so x equals 7 or x equals negative 1. And those are the solutions. 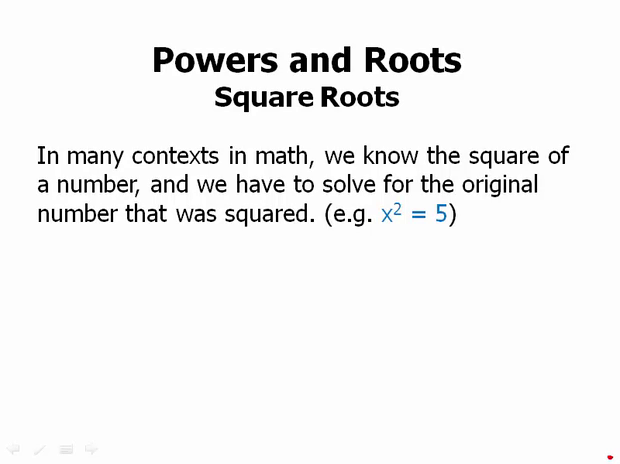 We also have to consider how square roots relate to the topic of exponential growth, which we discussed in the second lesson of this module. There we said if b, if b is greater than 1, then positive powers of b get bigger. In particular, if b is greater than 1, then b is less than b squared, b squared would be a larger number. If squaring makes these numbers larger, then taking a square root must make these numbers smaller. And so, the square root of b or radical b would have to be less than b. And that's if the base is greater than one. But as we saw in that lesson, everything is opposite for positive numbers less than one. If the base is a number between 0 and 1, then positive powers of b get smaller. In particular, if b is between 0 and 1, then b is greater than b squared, b squared would actually be a smaller number. If squaring makes these numbers smaller, then taking a square root must make these numbers bigger. So for a b that is between 0 and 1, it must be true that the square root of b is greater than b. Think about the number two-thirds. This is a fraction greater than 1 half. If I square it, that is multiplied by itself. What I get is four-ninths, and that's a number less than one half. Therefore, it must be true that the square root of four-ninths is two-thirds. And of course two-thirds is greater than four-ninths. So the square root of four-ninths is greater than four-ninths. And that's always true for a number less than 1, a positive number less than 1. The square root is always greater than the number itself. Here's a practice problem. Pause the video and then we'll talk about this. If 7 K is a positive integer and the square root of K is greater than K, then is K an integer? Well, the square root of K is greater than K, that only happens when K is less than 1. So K must be a number between 0 and 1. It can't possibly be an integer. Would have to be either one seventh or some multiple of two seventh, three seventh something like that. And so, we definitely know that it's not an integer and the answer is b, a clear answer of no. In summary, the radical sign always has a positive output. If we take the square root ourselves, we must consider both positive and negative roots. We've covered some basic approximations for square roots. If the base is greater than 1, then taking a square root makes things smaller. The square root of b is less than b. If the base is between 0 and 1, taking the square root makes things bigger, radical b is greater than b.